Free Comedy Night helping to fight Stress, Depression and Suicides. 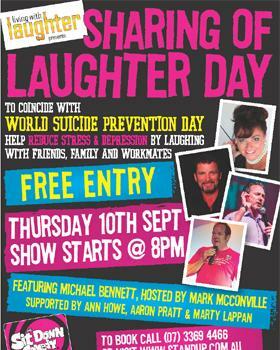 To coincide with World Suicide Prevention Day, ‘Living with Laughter’ a not for profit organisation is joining forces with ‘The Sit Down Comedy Club’ to present their ‘SHARING OF LAUGHTER DAY’ Free Comedy Show at 8 pm on Thursday, 10 September 2015. In 2012 Comedian and founder of ‘Living with Laughter’ Mark McConville, launched the “Sharing Of Laughter Day” initiative The ethos, anywhere and everywhere, in your Home, In the Workplace, in Schools, at a friend’s place, or even better still attend a Stand Up comedy show. All you have to do is SHARE LAUGHTER with someone who you feel needs a boost, and in doing so, you may just help save their life. ‘Living with Laughter’ is bringing together the amazing talents of Australian comedians Mark McConville, Michael Bennett,Anne Howe & Marty Lappan along with local up and coming comedians Aaron Pratt in its fight against suicide and depression.